Despite no official word from Microsoft, Remedy's Oskari Hakkinen is optimistic that his studio will be starting work on Alan Wake 2 very soon. Much like the game itself, the future of Alan Wake seems shrouded in mystery, and as yet there has been no official confirmation of a sequel. But Remedy's Oskari Hakkinen says he is hopeful that Microsoft will use its option for a sequel soon, even though the publisher seems more focused on downloadable content. Hakikinen says that Remedy was contracted to do two downloadable episodes, but that Microsoft is pushing for more: "There's been some discussions on it. Nothing's been confirmed. More discussions on the Microsoft side, they've been interested in more downloadable content and doing further episodes ... Where we're sitting right now is we'll see how these go. We'll see how the attach rate is to the episodes ... If that attach rate is then reasonable, I think we can look at maybe doing some more specials." Hakkinen is confident however, that a sequel will happen, and believes that Remedy could make it much more quickly than the first: "Max Payne 1 took us also five years to make. Max Payne 2 took us 18 months. I think we'd be looking at something of a similar cycle." 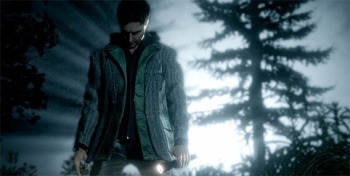 "We're still in launch phase of Alan Wake 1...but Microsoft have an option for [a sequel]. That was in the deal a long time ago...and I don't see why they wouldn't. We're happy with the partnership and they're happy with the game. I think it fits in their portfolio quite nicely. I don't see any reason why we wouldn't continue with Microsoft and why we wouldn't renew the IP...we definitely want a sequel of course."